This is a self contained cardboard viewer with a set of 8 3D Civil War images. Overall size of the set is six inches by ten inches while each stereo pair is two and one-half inches by five inches. Each set contains a set of built in plastic viewing glasses with a five and one-half inch focal length. Images include Sherman at Atlanta, Occupied Atlanta, Confederate Dead at Petersburg (two images), Little Round Top, Smoke Stack from Merrimac, Grant's Council of War, Gunboat Massasoit, and Bryan House on Cemetery Ridge. This set originally sold for $6.95. New Oh Wow! 3D greeting cards! These are exciting images of San Francisco that come with a viewer, ready to mail and impress your friends. Also birthday and other 3d greetings! We have some of the most unique stereocards available today. 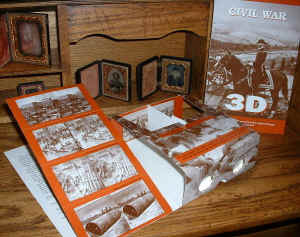 Our newest products are the 3D Dutch Masters and 3D Holland. Tired of sending the same old flat image greeting cards? Try these cards each include lenses built in for eye popping 3D graphics. We also have StereoCards Sets of reproduction Stereoviews for your Holmes or Holmes type viewer and the 3Discover system which allows for viewing of strips that are made for the viewer.. Also available are lorgnettes for viewing Stereo Cards. Introducing the Amazing 3DIQ Viewer and StereoCard system. 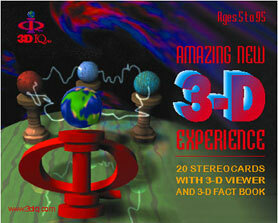 Enjoy the newest way to see the world in 3Dimensions with 3DIQ. 3DIQ Cards are clear undistorted, full color beautiful images that when placed in the 3DIQ Viewer come to life in 3D!